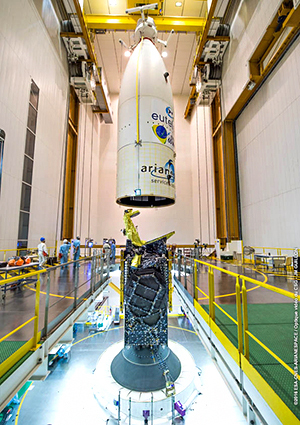 Arianespace’s second Ariane 5 for launch in 2016 is “standing tall” in French Guiana after the installation of this mission’s EUTELSAT 65 West A satellite passenger atop the heavy-lift vehicle at the Spaceport. This photo, taken in Spaceport Final Assembly Building’s upper level, shows the payload fairing being lowered over EUTELSAT 65 West A, which has been installed on its Ariane 5 launcher. During activity in the Spaceport’s Final Assembly Building, EUTELSAT 65 West A was mated to Ariane 5 and encapsulated inside the launcher’s ogive-shaped payload fairing, enabling final integration checkout to begin today. It clears the way for a launch readiness review on Friday, March 4, to be followed by the launch vehicle’s rollout on Monday March 7, leading to an early morning liftoff from the ELA-3 launch zone on March 9. Ariane 5 will deploy the 6,615-kg. EUTELSAT 65 West A into geostationary transfer orbit during a mission lasting 27 minutes. This spacecraft was built by SSL and is to operate from a geostationary orbital slot of 65 deg. West, providing relay capacity for the Paris-based Eutelsat to expanding markets in Brazil and across Latin America. Arianespace’s upcoming mission is one of 12 liftoffs planned in 2016 by the launch services provider, using its complete launcher family composed of the heavy-lift Ariane 5, medium-lift Soyuz and lightweight Vega.